Setting out the angles for the vertical stabilizer has taken a fair amount of time to make sure the angle of the vertical support is correct while remaining vertical to the workbench and the centre of the fuselage. Before cutting and drilling and components, take time to set them out correctly and make sure all pieces are set out in the order detailed in the plans. TIP: With the external corners removed, move the fuselage close to the front edge of the workbench which will leave plenty of room to set out angles and distances for the stabilizer. 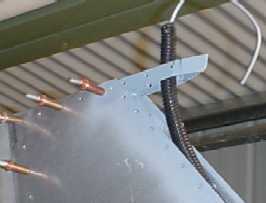 Clamp the fuselage to the bench along the centre line by placing clecos through the exposed holes. This will keep the bottom flat and prevent movement. Before riveting or bolting any of the pieces into its final position, use clecos to hold each section into place and use a plumb line to make sure the top centre of the stabilizer is above the centre line of the table. Even thought the R80 will have a noise wheel, I have installed the fasteners in the tail section to support a tail wheel and spring. As I will be installing a Jabiru 3300 engine with a clockwise rotation viewed from the pilots seat, the stabilizer is offset to the left by a line 20mm left of centre from frame 1. 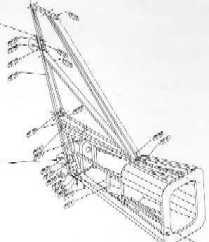 A string line is used from the first frame through to the top of the stabilizer to get the correct angle for the top of the stabilizer. Everything is now set to dismantle the entire stabilizer in preparation to debur all the holes, spray paint the metal surfaces that will come in contact, put it back to gether again riveting and bolting each section as I go. You maybe able to see the stringline from frame 1 over the top of the vertical stabilizer and the plumb bob and square on the centre line of the workbench. This is make sure that the stabilizer, while offset to the left, remains vertical and centre while drilling and attaching the clecos. 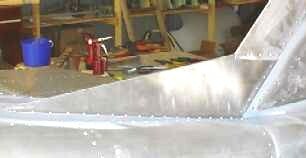 TIP: Keep the frame fixed to the workbench along the centre line so the tail remains vertical with the frame. 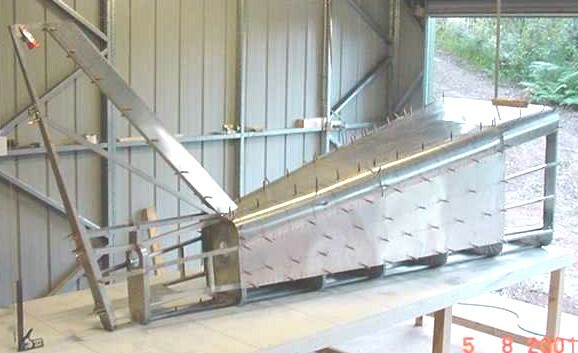 The skins and leading edge of the stabilizer have now been completed, however before riveting into place, the string line and plumb bob are set up again to make sure that the stabilizer remain vetical with the workbench. 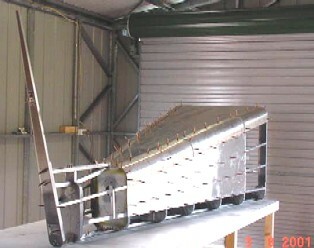 However, don't rivet the U shaped section under vertical stabilizer to frame 7 at this stage as the fuselage still needs to be secured to the workbench for the assembly and fitting of the rubber. 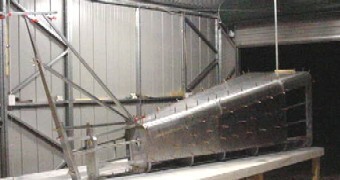 When the rudder is installed, a hole will be cut to allow the rudder control cable to pass through the skin and connect to the rudder control arms. TIP: Start riveting from the centre of the skin and work out to the edges in a circle alternating from side-to-side to maintain tension in the skin. 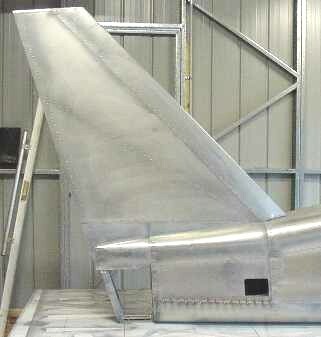 The leading edge is the last section to rivet into place. After riveting the vertical stabilizer sometime ago, I decided I would install a tail mounted strobe which fits over the top of the tail section perfectly. The black plastic pipe you can see in the stabilizer is automotive ducting to protect the trobe cable which runs inside the fueslage, up through leading edge of the stabilizer. I removed all the skins as I replaced some of the pop rivets in the tail with solid rivets and replaced the main support 1/8" rivets with 3/16" rivets to give it more support. I know this is not necessary and not included in the plans, however I did it for my own piecec of mind. 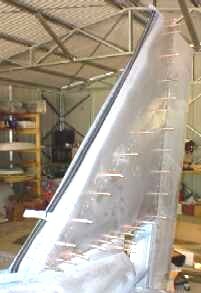 With the skins remover I have also constructed a fin to join the vertical stabilizer to the fuselage. This is not included in the drawings, but when I was visiting Sean and Marlene at the factory in Montreal they were taking about putting a fin on the new four place 164 and have simply used their design. Besides I think it improves the shape but not sure if it will improve the performance.